Purchased this OutRun boardset from the states. It was sold as faulty. The seller included some free food, which kept me happy whilst I stared at the black screen it presented me with on boot. First thing I did was to verify an EPROM with RomIdent. This showed this was actually an OutRun boardset converted to Turbo OutRun. 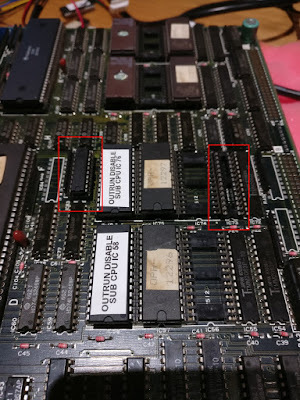 I then tested the 2 boards against a known good set, and found the lower video PCB to completely working. Fantastic! This saved me building the interconnects that ColinD kindly sent me this time round. I swapped the security FD1094 processor with a vanilla 68000. I programmed some decrypted ROMs. I was greeted with the following screen. Progress, but this was a bit of a red herring. It crashed immediately after this screen. 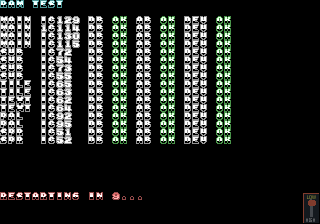 In fact, this screen was an addition of the Japanese decrypted roms I'd happened to use. 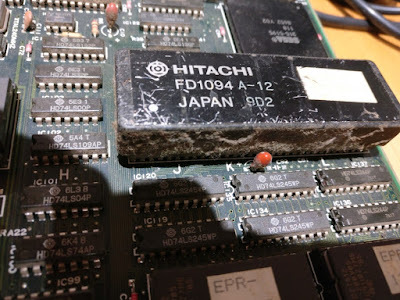 It's possible that the security processor was still working, but I'll go back and check that later. 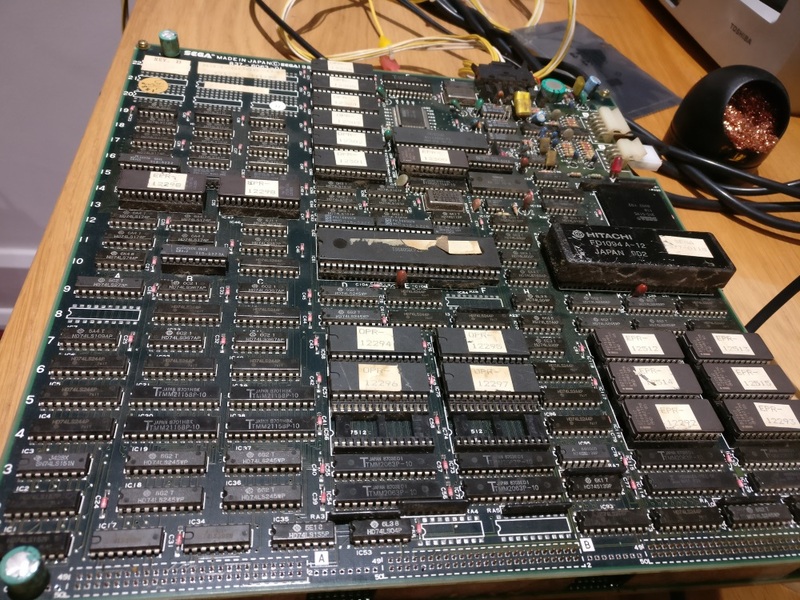 I dug out the schematics and found an LS244 with dead outputs @ IC83. 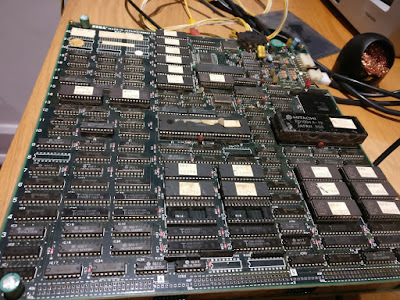 This was part of the sub CPU memory addressing. 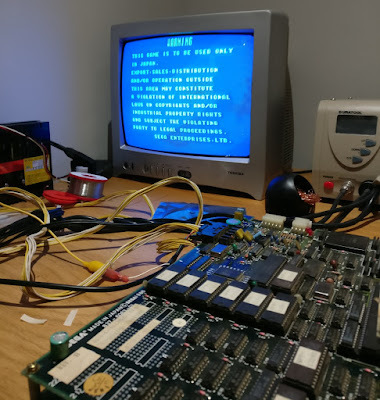 I socketed it and swapped it out, but it didn't make the game boot, although the logic probe showed its pins were doing something at least. At this point I decided I wasn't going to change any more components without better diagnostic information. I'm slow at desoldering, so shotgunning stuff wasn't a good idea. 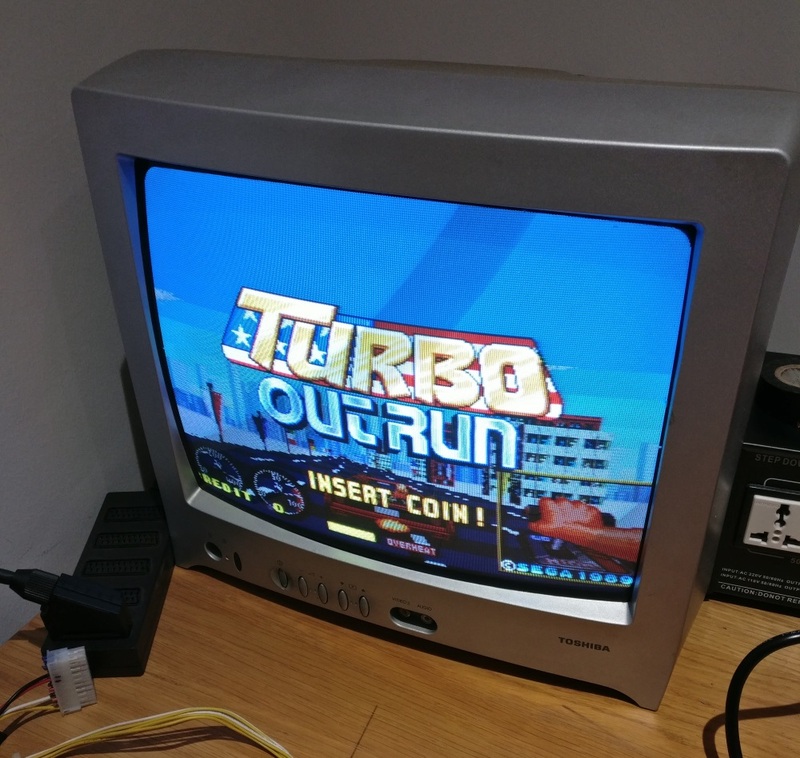 I used the OutRun SDK, created by Alex, to code a test tool for OutRun. Alex had already started work on the tool and I made some further modifications. 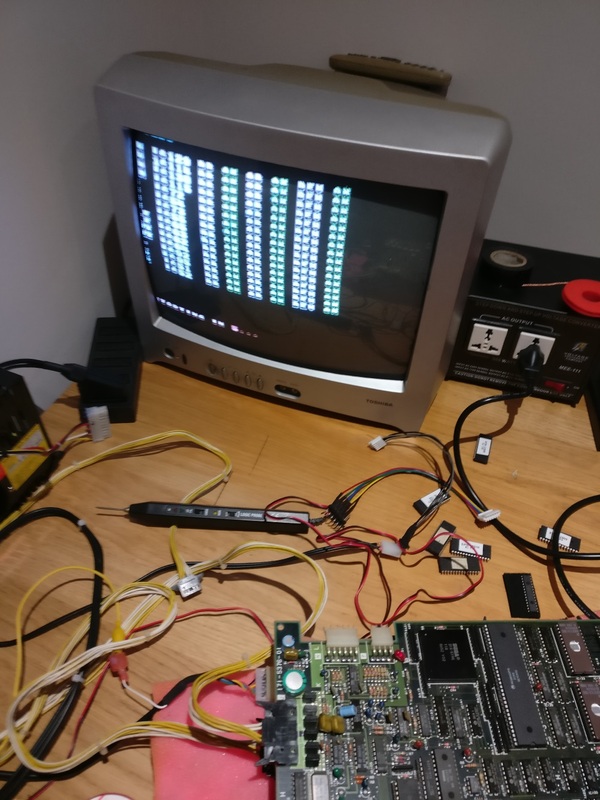 My theory was that I needed a minimal piece of software to test as much of the hardware as possible. 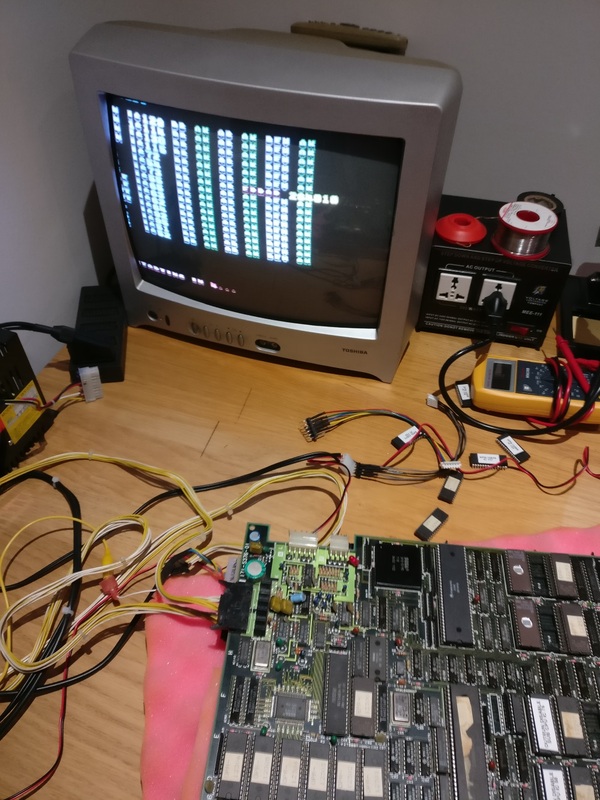 The problem with the on-board tests on OutRun, is that they require most of the PCB to already be working in order to use them. So they are mostly useless. 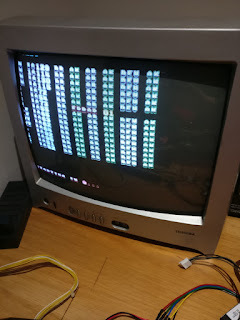 I spent a couple of nights changing the tool so that it would test the 4 Main CPU SRAMS, the 4 Sub CPU SRAMs, Tile RAM, Text RAM, Palette RAM and Sprite RAM. 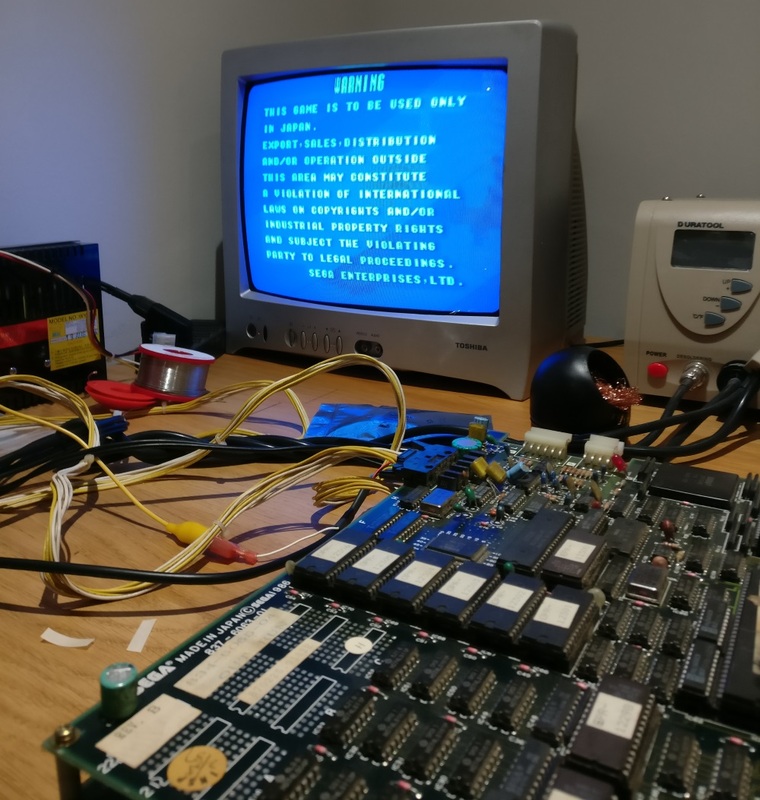 The tests that Alex had included were far more rigorous than OutRun's onboard tests, with separate address bus and data bus tests. The program reported the Sub CPU RAM @ IC 73 was bad. I also verified that the ICs reported by the program were correct by glitching some of the SRAMs whilst it ran. After hours of swearing and desoldering (mostly due to the ground plane) I'd removed the offending SRAM and socketed the IC. Personally, I find these boards an arse to work with. 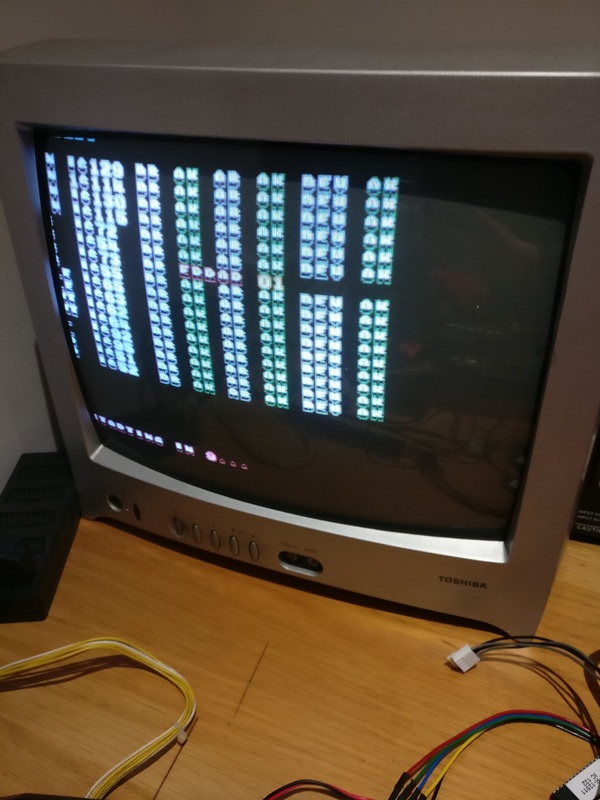 I have a lot of respect for Mark at Retroclinic now. At this point, the test gave me a different error because the SRAM was completely missing. Promising! Inserted a replacement SRAM and BOOM - all OK!